The Chelsea Painters are exhibiting at the Power Center for the Preforming Arts in Ann Arbor, MI, this month. The theme for the show is the Elements. Some artists did paintings that focus on just one of the elements, others did a combination. When you think of the Elements, of course you think about nature. That naturally renders landscape type paintings. I wanted to do something different and veer away from that path, so I decided to do a still life. And as you can see, I set up my scrabble board. This turned out to be a difficult piece for me. I quickly came to the conclusion that I’m not a fan of drawing letters, which you have to do if you’re doing an art piece with words in it. This piece was on my drawing board for two months. I’m pretty darn sure it’ll be a very long time before I even think about doing words again. Unbelievable!! No wonder it took you so long.. it is so exact that when I first looked at it I thought it was a photo of a Scrabble Board. I so admire your patience and skills of observation and drawing… Amazing work! Good luck. What a creative and well-executed piece. All of your patience was well worth it! Hey Dee, that’s a really cool piece! It’s great to see it after hearing your verbal description. I would have gone crazy drawing all those letters, grids and spaces. Crazy. You are amazing. wow, i thought this was a photo. Amazing. 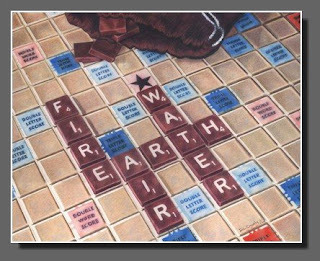 or play scrabble? Beautiful piece of work! Thank you all so much for your comments!! I’ve been away from the blog for way too long. Many things on the plate. LOL and yes, once the art piece was done, we could start playing the game again.